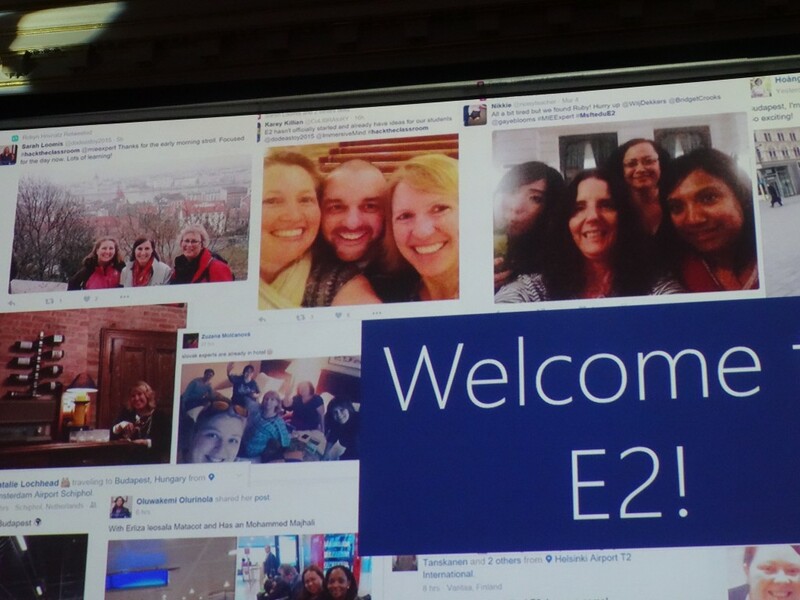 It’s been nearly two weeks since the E2 conference ended in Budapest, Hungary. I was one of nine teachers from the US who joined about 275 educators from around the world at this conference. Many people have asked about this experience and yet, words like amazing, unbelievable or fantastic don’t capture the experience adequately. With the climate of teacher bashing so prevalent in the US, going to a conference where teachers are celebrated and treated as rockstars, feels like you’ve stepped into a magical make believe world. 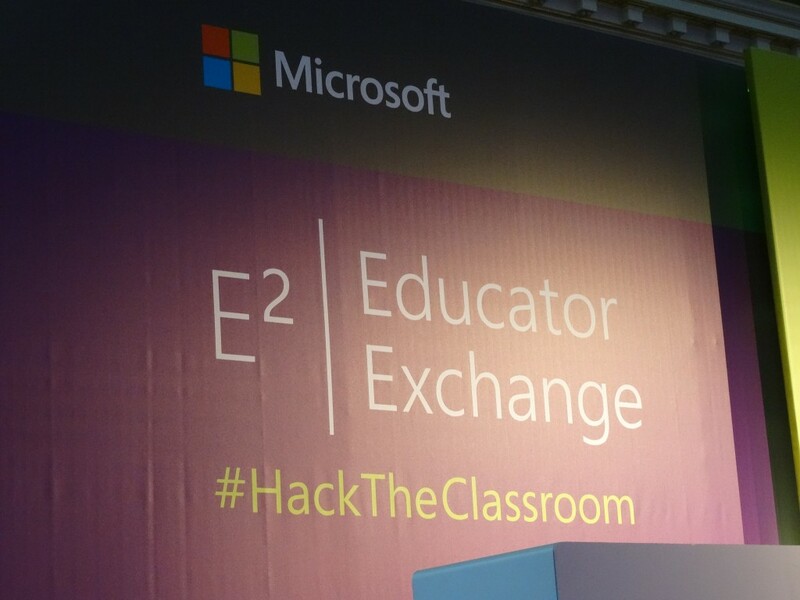 Instead of being questioned about every choice we make in the classroom because someone wants to tear it apart, E2 teachers are questioned about how Microsoft can improve their products to make them work even better for teachers and students. The excitement of this extraordinary group of educators in one place is infectious. 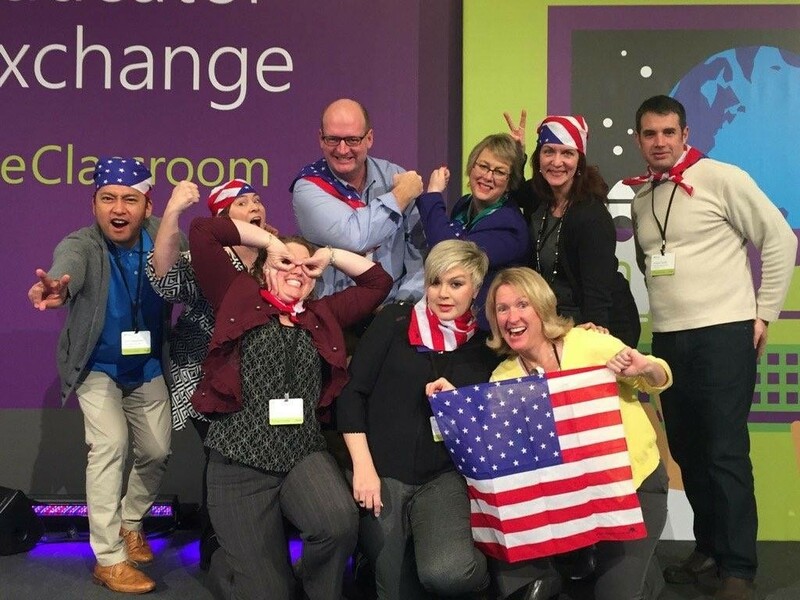 Cameras flash non-stop, OneNote cape selfies abound, and teachers can get pretty silly. Yet, the conference is work…hard brain work. The lightning fast boot stomping of the Hungarian dance group, Varidance, set the tone for the week. We listened to the Microsoft corporate Vice-President of Central and Eastern Europe and a member of the European Parliament speak about the importance of teachers. A panel of speakers discussed how Minecraft has a role in today’s classrooms. In fact, Minecraft was present in breakout sessions, keynote speeches and table conversations. I’m not a gamer, but after hearing how playing Minecraft can enhance student learning, I am interested in learning more about how it can be utilized in the library classroom. The theme of Hack the Classroom defined our collaborative team work. 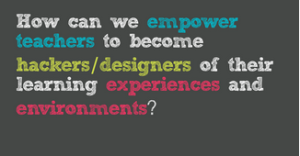 We had to design a classroom hack in an assigned persona: Gamify, Personalize, Minimize, Simplify and Strategize. Our Hack had to be shared in an Office Mix and couldn’t be over 3 minutes long. Each teacher was assigned to a team, where we had to find a common problem and a solution to it. Oh yes, and it had to be done quickly, with teachers who speak different native languages. These team challenges are part of the magic of the conference. Everyone is thrust into a collaborative situation that is difficult, and yet the experience breaks down barriers. After a couple days of intense meetings, new connections are launched. I am still friends with the members of my team when I attended the Global conference in Barcelona. I hope the same holds true from my Budapest team. 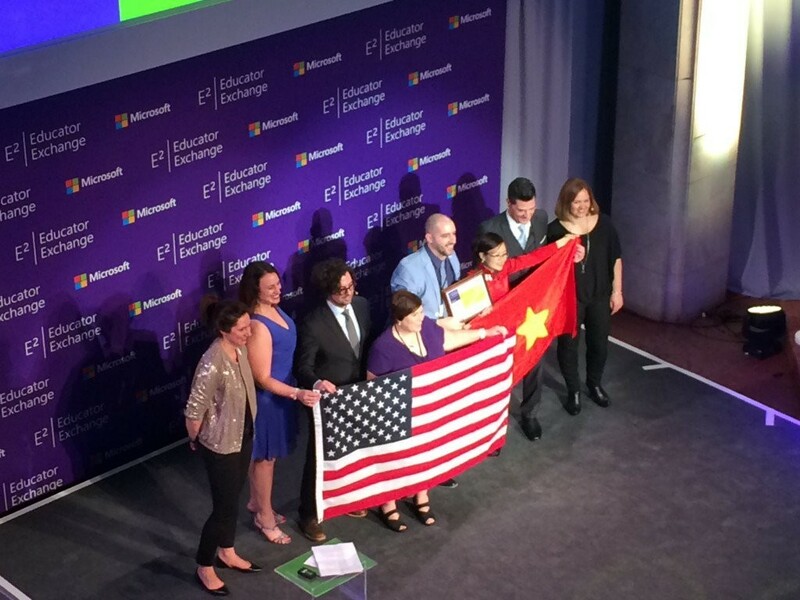 One of our American team members was part of the winning Hack the Classroom team. Here is their classroom hack. I especially liked the breakout sessions on a variety of topics led by fellow teachers. It’s one thing to hear about a product from a developer’s point of view. It’s invaluable to listen to a teacher model how that product can be successfully used in the classroom. Like at any conference,there wasn’t enough time to attend all the sessions I wanted to visit. 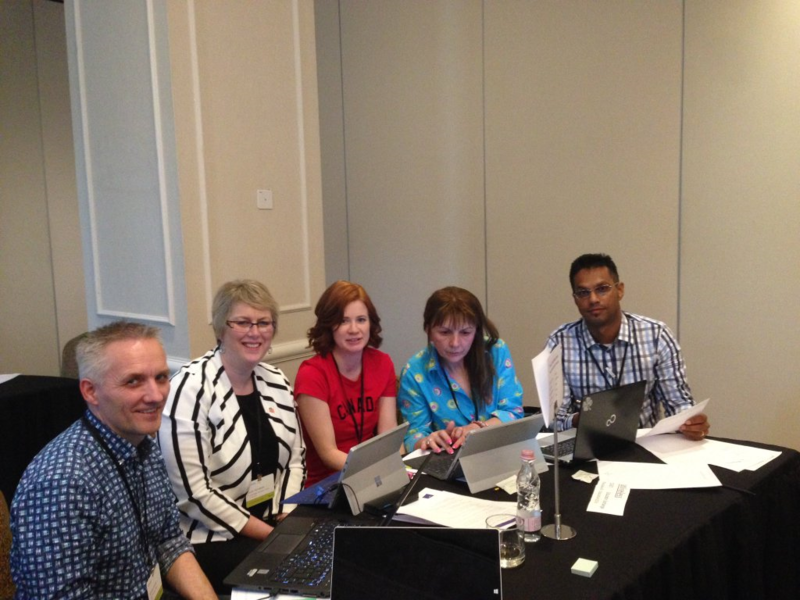 I did really enjoy the sessions on using Sway and OneNote Class Notebook. I really hope these tools will be available for my students to use at home. The ability of Office Lens to take photos of documents where you can then store them in OneNote was really intriguing. The Office Mix add-in also offers new tools for recording information within the familiar context of Powerpoint. It’s exciting to see how the new tools can enhancing lessons. The tests takes 90 minutes and I was very excited to learn I had passed. Whew! 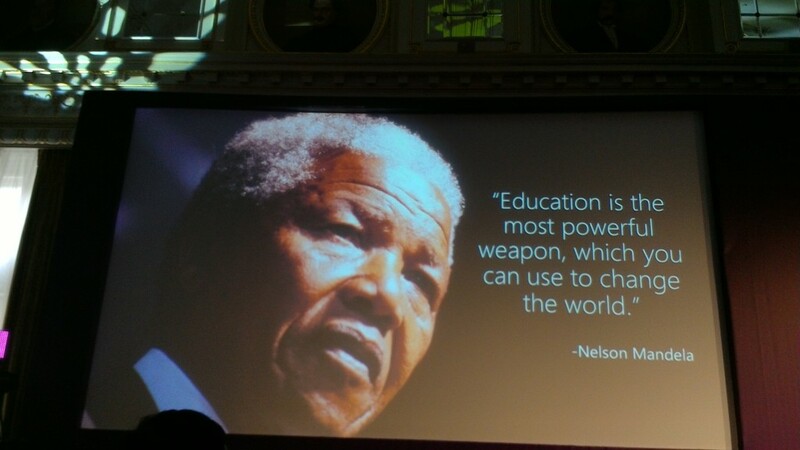 During the second day keynote address, Anthony Salcito, the Vice President of the World Wide Education team emphasized the mission of the Microsoft Education team. We had a chance to Skype with an Arctic Explorer and hear what it’s like to live in such a harsh climate. 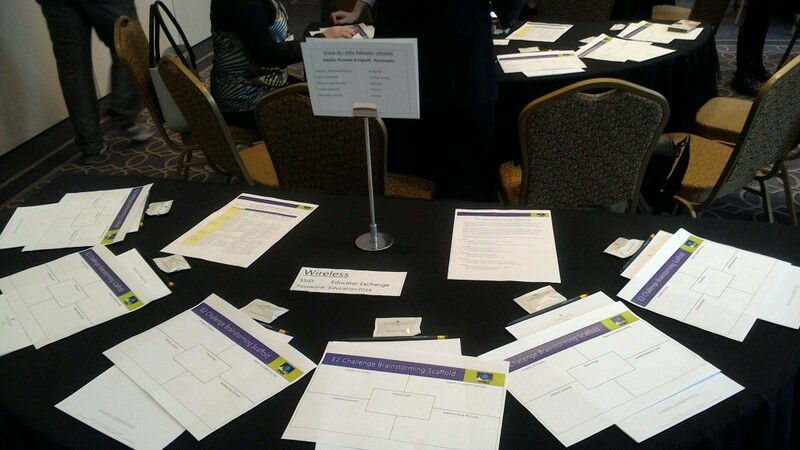 On the last day came my favorite part of the conference – the Learning Marketplace! 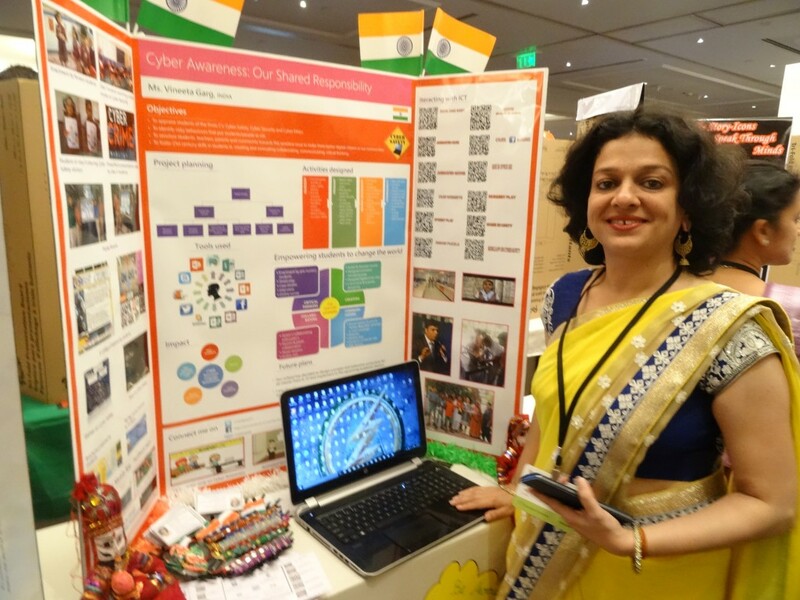 Each educator set up a trifold poster detailing the project they focused on at home with their students. The trick is to be at your booth to meet other educators and tell them about your project AND move around the room meeting others and hearing their stories. I visited as many booths as I could, but it’s never enough. 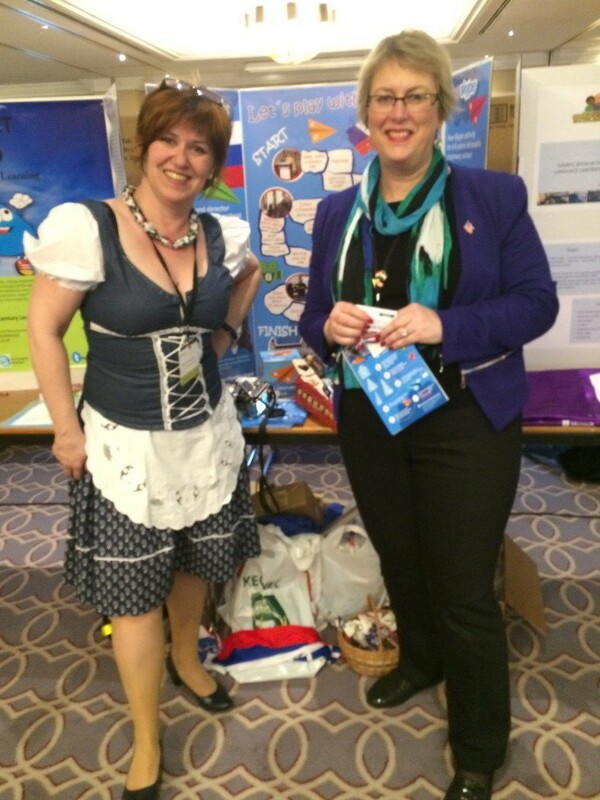 If I could get my wish, we would have some Learning Marketplace time every day of the conference. More time with colleagues allows for more indepth conversations with each other. This is my third experience at this type of Microsoft conference. The Learning Marketplace has been the highlight of the trip every single time. Getting a new perspective on how to use tools is invaluable. We all bring these ideas home to try with our own students. The last evening of the conference was the celebration time. 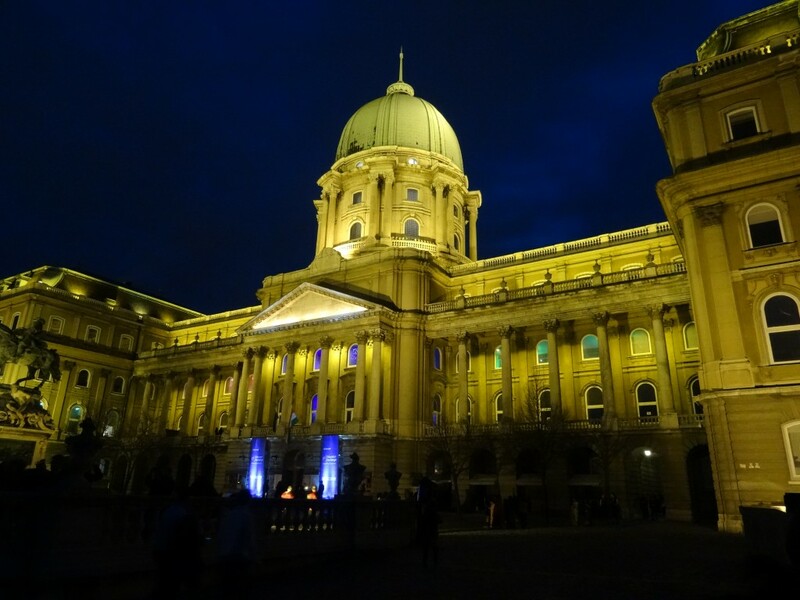 Dressed in fancy cocktail attire, we were bussed to the National Gallery of Budapest to spend the evening at the building that houses some of the most renowned Hungarian art. There was an award ceremony where the winners of the Hack the Classroom contest were announced. As each team hurried to the stage, with each member proudly carrying their national flag, we all cheered and clapped for the winners. Whatever national or cultural barriers might exist at home, have no place on the E2 stage. We are all one group of educators who want the best for our students. As a person who loves the written word, I feel inadequate to explain how this conference is the cherished food that fills my teaching soul. I encourage everyone to apply to become a Microsoft Expert Educator and experience the value that comes from collaborating globally with other passionate educators. Jordan Shapiro, an internationally recognized speaker, lecturer and journalist, who writes about global education and game-based learning published an outstanding article about E2 in this Forbes.com post. Maybe this video will lend a taste of the excitement, that my words can’t convey. All I can say is Thank you Microsoft! Thank you for changing my life in 2012 when I became part of the MIE family and for each year since. You have taught me how to lead my students to take risks and achieve more through the use of technology. You can find out more information on the Microsoft Educator Program by clicking on this link here. 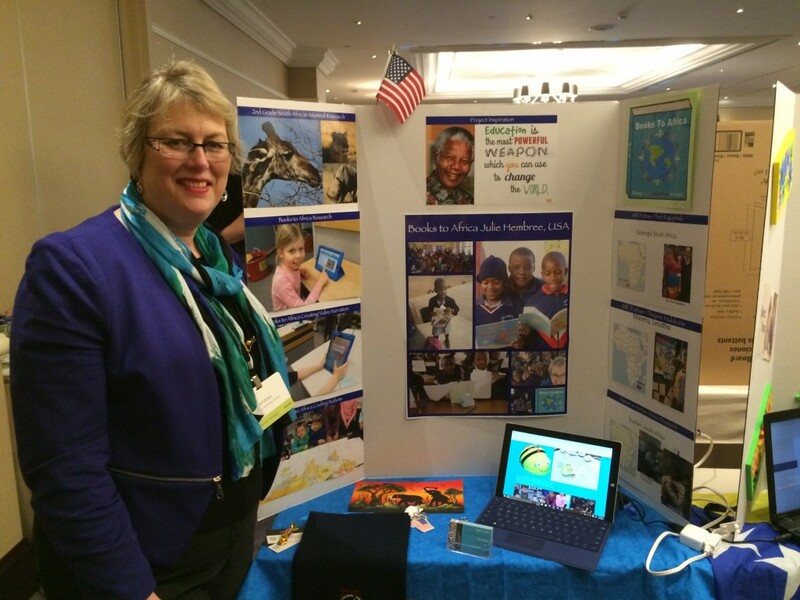 This entry was posted in E2 conference Budapest, Expert Educator, Library News, MIEExpert, Technology by Mrs. Hembree. Bookmark the permalink. Your words and pictures did capture the experience of this amazing opportunity! We’re glad, but not surprised, that you were chosen once again to attend. Thank you for sharing your experience and how it inspires you (as you inspire others).